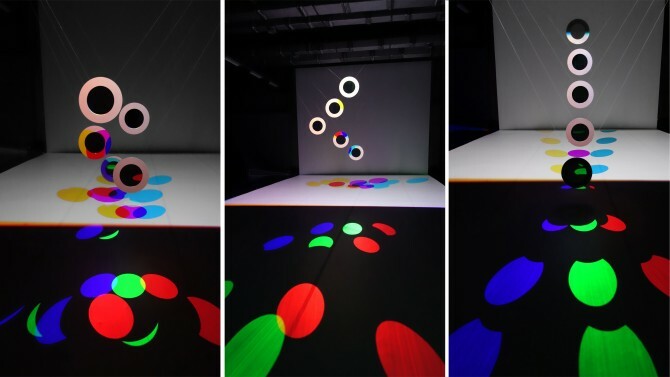 RGB|CMY Kinetic is a poetic experience of colour, movement and sound. 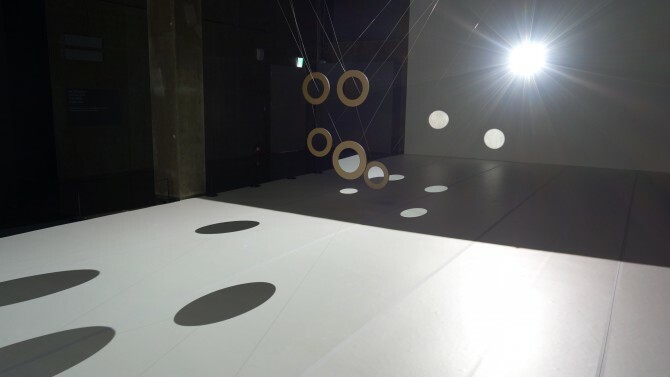 Simultaneously a suspended sculpture and a choreography of light and music, it has roots in two twentieth-century avant-garde traditions: kinetic art and light art. 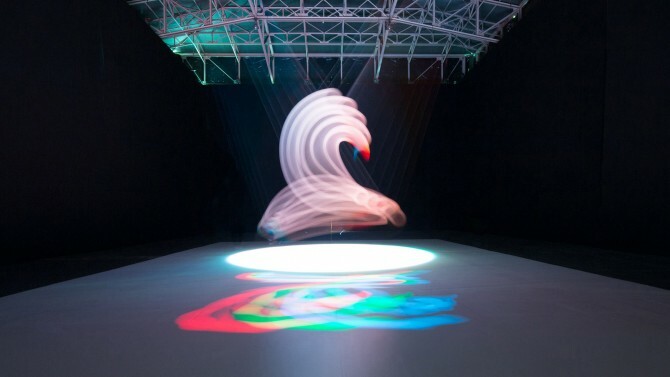 The inspiration for the work stems from the nature of light, particularly from the duality of additive and subtractive colours. 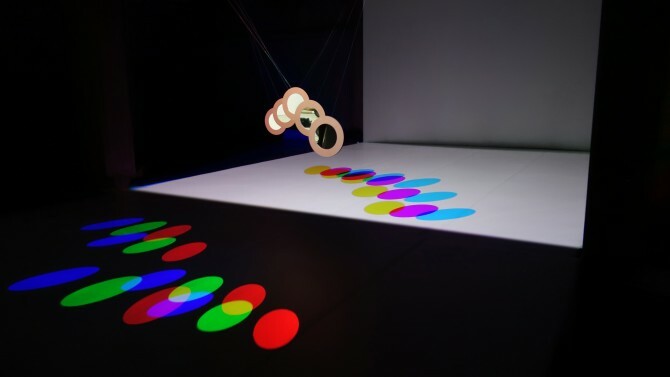 Five flat, disc-shaped mirrors move through space, seemingly floating, illuminated by lights in the three primary colours, red, green and blue (RGB). 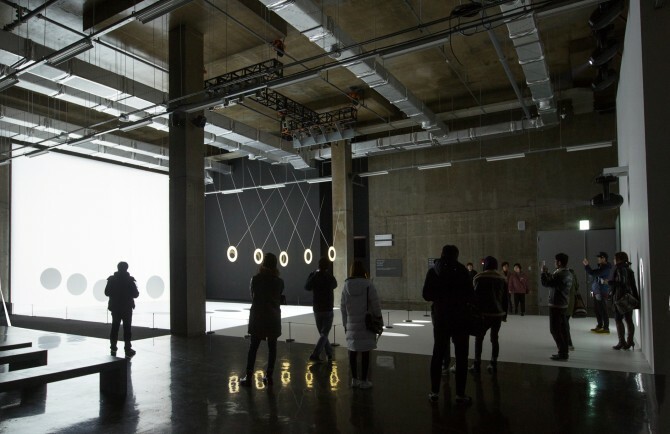 The discs reflect the light and cast coloured shadows onto the screen on the floor. 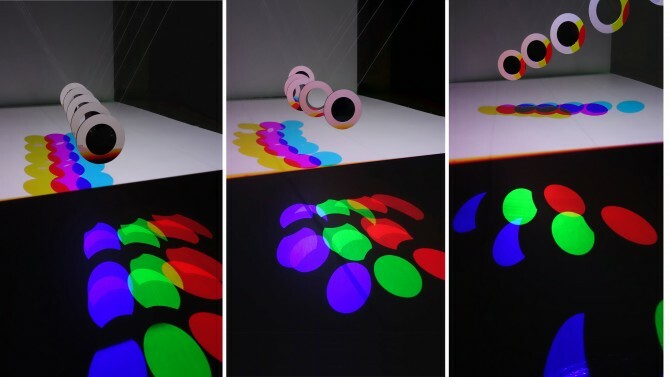 Where the RGB colours combine, a circle of white light is produced on the floor. 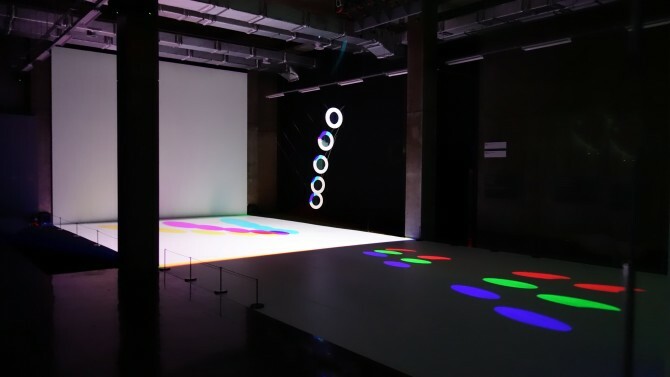 This set-up provides the basis for a poetic choreography and the immersive, spatial experience of colourful, synchronised lights and shadows moving in unison with the computative and apparently weightless motion of the discs. 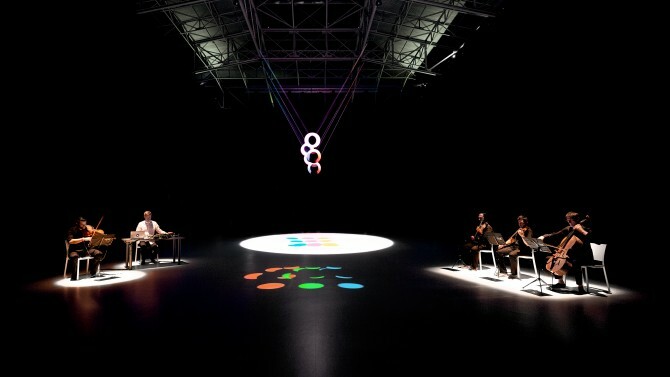 The coloured ellipses on the ground are generated by the three primary colours through addition and subtraction. 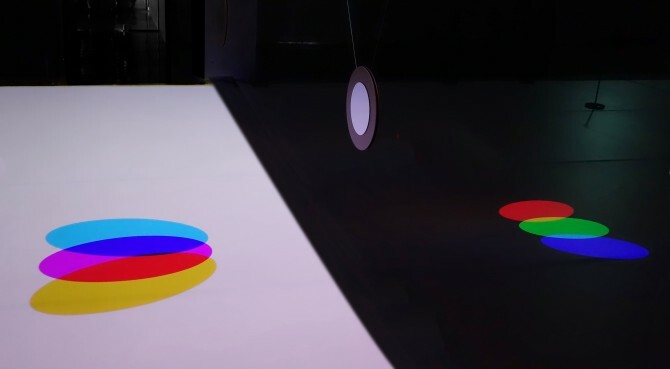 The mirror discs cast shadows behind them on the ground, and in these shadows the primary-coloured light subtracts into cyan, magenta and yellow (CMY). 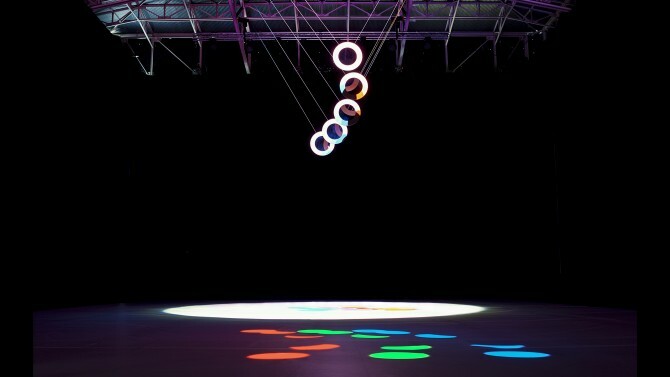 In front, the discs reflect the RGB light as individual colours onto the ground. 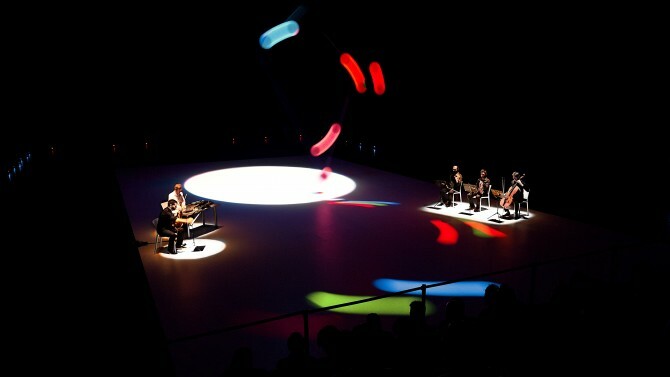 This choreography is complemented by a musical score that unfolds in dialogue with the discs’ movements. 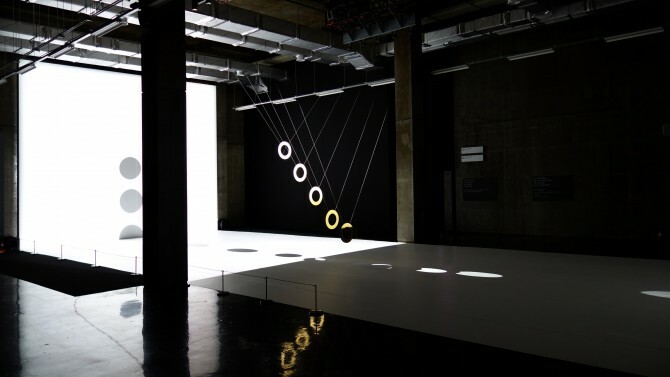 The three-part sound composition for RGB|CMY Kinetic was made by Icelandic musician, Ólafur Arnalds. 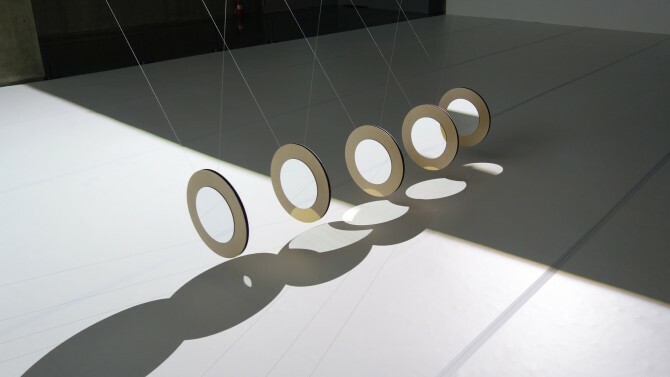 The first part of the composition is based on the movements of the mirror discs: the varying heights of the discs in space modulate the five digital instruments. The following two sections of the composition interpret the computatively designed choreography more freely. 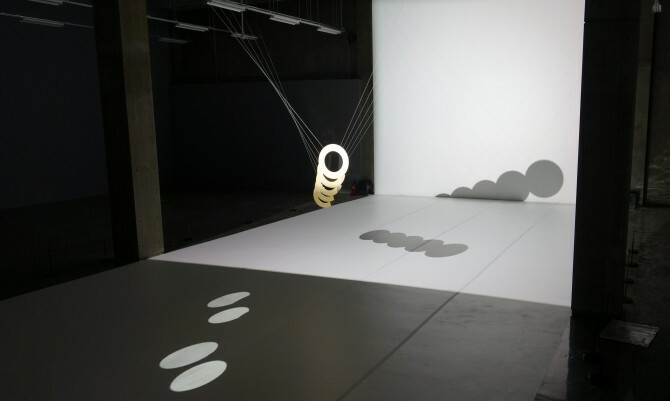 The work draws on earlier kinetic sculptures and reflective kinematronics by ART+COM Studios, and, at the same time, explores the poetic potential of a minimal, yet large-scale, mechatronic installation. 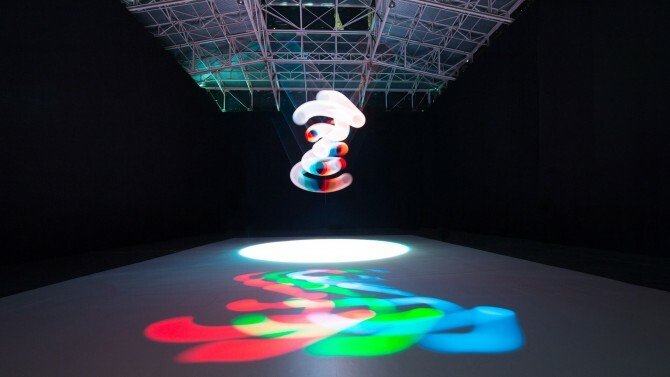 The installation RGB|CMY Kinetic was commissioned by Sónar and the Sorigué Foundation and premiered at SónarPLANTA Barcelona in 2015. 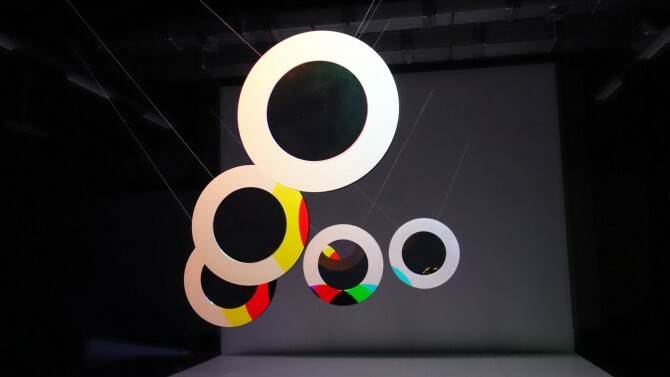 Expanded by the dimension of black (the ‘K’ in CMYK stands for key=mask=black), RGB|CMYK Kinetic is a new work produced for the opening exhibition at the Asian Art Center in Gwangju, South Korea. The installations were manufactured and installed by MKT. Images 1, 5, 6 © Flavio Coddou.